you find food in cans and processed food in packages. the outer edge of the shop. the produce isle. Wise advice. I'm trying very hard to avoid sugar now days but just had to buy some for the hummingbirds. You are a dear to feed those sweet little things. I do too. I haven't bought sugar in quite some time but I have recently again..... the big bags of organic sugar from Costco for the fermenting. But all that sugar is eaten up by the whey during the fermentation process and that is what's so wonderful. Nature is strange and beautiful..... isn't it?....... if you leave it alone. Is it actually eaten up or is it just converted to a different form? Either way, isn't it still sugar? Thank God there is wine on the perimeter at my grocery store! Now there's a good fermented drink for ya. Good thing there isn't any sugar in ice cream - wait...what? And you say there is sugar in the Organic Ginger Squares, too? You are right on! Sugar is the new poison and it is addicting as well. I am trying to break the addiction, but do need a spoonful in my coffee (used to be three) and I share an occasional desert when Mrs. C and I go out to eat. Trying to cut way back on bread and pasta as well as that just turns to sugar. You know what Mary Poppins said about a spoonful of sugar. LOL I need that to make the cod liver oil go down. Haven't had sugar or processed or junk of any kind in two and a half years. Unless you count cashews, but they have the good kind of fat and stuff in them. I think you get plenty of points for trying. I've noticed if I eat more fat, the sugar craving goes away. And I hear through the "grapevine" you are doing a very good job. I mostly stay to the outside aisles. I do buy sugar though. If I quit putting sugar in the iced tea, I think my husband would shoot me. I also do bake sometimes. I wish I could buy the organic sugar from Costco all the time. Can't always afford it though. And I am a fan of coconut sugar, but I haven't had that in a while either. I don't think I've ever had coconut sugar. Thanks for the tip. I'll try it. Happy week end. I tried coconut sugar and couldn't drink the coffee. Threw away the sugar. It's probably okay for baking, but I don't do much of that these days. mince pies at Christmas is about all I bake. Hi Manzanita - I'm not brilliant but am pretty good and don't eat what I classify as junk food .. though some things we can't (easily) avoid at certain times .. though I'm always aware of the 'bad' things .. I know there will be no junk food for you. Hardly ever. Not with those great food menus you write. yummm. I'm good now about heading straight through the bakery section to fetch the Mama's dessert -- blueberry-cheese puff pastry. It's sweet but not too sweet, she says. She has one, sometimes two, every other day. She works in the garden every day so she works it out. Not like me. Blueberry-cheese puff. Now that does sound exciting. It is something I know my mother would have enjoyed too. It seems the older "set" got off to such a good start with REAL FOOD that they can still eat anything they want. I am terrible when cravings set in. Just terrible. I admit it. This has been a hard week for me in terms of migraines. Logically I know that means I should try EVEN HARDER to only eat whole foods. But, I crave the other stuff. Just crave it. My adrenal gland is going nuts and all I want is JUNK. So, a couple of nights ago what was I doing? Eating out of the Cheez Its box (my father's favorite snack outside of ice cream... so it's like he's there whenever I eat it) and drinking a Cream Soda (which always brings back extremely fond camp memories). Two things I absolutely shouldn't have been eating, yet... so comforting. I'm not sure I'll ever be able to completely get rid of the junk. But I try to avoid it... most of the time. Better still only go to the supermarket for toilet paper and cleaning products, shop at local fruit and butchers for food. So much truth in that. That is the only time I go in the large super markets. I've been doing so much fermenting and I'm baking bread again and I love the fresh food markets. I've been thinking of you but still going crazy tryig to get IT all in. Just down to the nitty gritties in the garage but that means picking through everythig. uuug It's hard to believe I could cram so much stuff in that size space. You don't eat junk food. I hate the concept of junk food. People act like everything is bad if you don't have broccoli and salad for dinner. Just came across a story of an elderly woman who outlived the doctors who told her to stop drinking soda. Dr. Pepper seemed to be the wisest doctor of them all. It's usually the sneaky way they put sugar in everything (and in various forms) that makes it jumk food. One doesn't notice while still young but once you get older, it shows how it has taken a toll on the body. A student of mine has a grandmother who is 105 and she has never drunk water. She only drinks coffee. Shop the perimeter is excellent advice. I remember working on checkout and every Saturday morning a young mum would come in with her three small daughters, one just a baby, and her cart would be filled with 90% fresh produce. A delight to see and we got quite friendly over the year, then a new supermarket opened closer to where she lived and I never saw them again. It's a little sad when you meet people you like but then for some reason you never see them again. I'm curious about what you ate while growing up that has you so concerned for your health now? If I'm concerned for my health, it's because I don't want to be a burden to my kids. I've seen too much of that. I'd like to remain active and in my own home until my time is up. manure and there were no fat people, no matter what they ate. Nor did I ever hear the words, cancer, autisum (I don't even know how to spell it....ha) Very few heart attacks, yet most people smoked. So I figured that must have been the perfect diet and after yo-yo eating, I'm back to where I started. But it so difficult to find the REAL FOOD now. I hadn't thought of the grocery store in these terms, but you're absolutely right! Thank you for the insight. Happy A to Z! I hope you are enjoying the A-Z. You have an interesting and colorful blog. It is my pleasure to meet you. Great post. I'm following you on your listed social media sites. Thank you for dropping by and I enjoyed your visit. Thank you for following my blog. I tried to follow yours, too but I never understan the google blogs. So I have to avoid that middle aisle in my supermarket that stocks the wine? Perhps there's a bit of wiggle room in your wise advice? 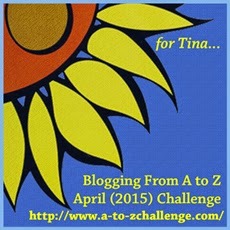 Good luck from a fellow A-Z blogger. You're so right. When I was young I could get away--or thought I could--get away with eating anything without suffering any consequences. Now I feel it when I've eating something I shouldn't have. Interesting observation that the sugar is placed in the middle and the healthy stuff on the peripheries. I'm really enjoying your theme for the month. Shopping the perimeter is great advice. Wish I had done that in the earlier years. Weight Watchers got me doing that. Also I grow some of my veggies but every now and then------oops. I love cakes and cookies and admit that I am an addict. I try to limit my intake, however, because I am feeling it these days! I'd like to have more energy to get me through my days instead of feeling drained. I also want to stay at a healthy weight. As people age, they can't process sugars and unhealthy fats as well. My doctor says I'm experiencing adrenal fatigue. Luckily, somehow I have avoided the dreaded diabetes and pre-diabetes, like so many Americans today! Must be doing something right! Great post, must have touched a nerve!